Miss Joan Brookes, the daughter of John Henry Brookes after whom the University is named, died on Saturday 12 March 2011 at the age of 90. She had been a great friend to the University and had been extensively involved in the preparation of a biography of John Henry Brookes, currently being written by Bryan Brown, Honorary Fellow of the University and a past member University Court. Her death is announced in the week that the University is to celebrate the unveiling of a Blue Plaque on the Brookes family home in The Slade, Headington, Oxford, and will shortly be breaking ground on a new building, mirroring the history of the move to Headington in the 1950s. "Joan was a remarkable woman. Her memory was incredible, with a recall of the details of family life that have been so helpful. She was very precise but always combined with a warmth and a twinkle in her eye. Joan knew of the Blue Plaque ceremony this week and although she was not planning to attend, was very proud that her father's educational values were embraced by the University of today." John Henry Brookes was appointed Principal of Oxford School of Art in 1928, and retired in 1956, having overseen a dramatic change in the educational opportunities for the people of Oxford and the move to new buildings in Headington. His time as Principal cemented the values of what has become Oxford Brookes University, and it was for his inspiration that the University took his name in 1992. He died in 1975. Joan became a teacher and never married. She last came to the University in 2006, for the inauguration of Professor Janet Beer as Vice-Chancellor. The family home will be marked by the unveiling of a Blue Plaque on Wednesday 16 March 2011. 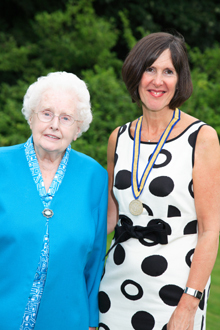 The picture shows Joan Brookes with Vice - Chancellor Janet Beer.